How does your breakfast make you feel? Balanced nutrition: Provides important vitamins and minerals to help you achieve your Recommended Daily Allowance (RDA). Weight control: Science-based meal replacements like Formula 1 Shake, have been shown to be an effective way to help you control your weight, as part of a healthy active lifestyle. Protein: Rich in soy protein, Formula 1 Shakes help you build lean muscle mass, along with exercise. By increasing your percentage of lean muscle mass your metabolism is also increased meaning you’ll burn more kilojoules – even while you are sleeping! Formula 1 is a delicious shake that provides some of your daily essential vitamins and minerals. Formula 1 Shake is a convenient alternative to a kilojoule-controlled breakfast. Consume as part of a varied and balanced diet and healthy active lifestyle. Do you start the day with a rich espresso, or a high kilojoule coffee? Too much caffeine, sugar and cream can make you tired, irritable and more likely to gain weight. At just 26 kJ, the Instant Herbal Tea can be enjoyed hot or cold and guilt free throughout the day. If you’re feeling less than your best, your fluid intake may be the reason why. By livening up drink time with this refreshing original or mango concentrate you may find it easier to get the fluid your body needs to stay happy and hydrated. 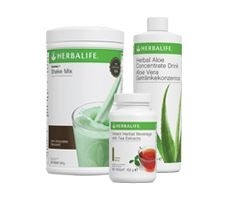 Herbal Aloe Concentrate is a delicious alternative to sugary soft drinks. © 2018 Herbalife International of America, Inc. No reproduction in whole or in part without written permission. All Rights Reserved. All trademarks and product images exhibited on this site, unless otherwise indicated, are the property of Herbalife International, Inc.